Many companies wish to establish the “design space” of their product in transportation networks. The following three documents have direct reference to product design space. ICH Q9 guidance on risk assessment. Product Transport Validation should be initiated by Phase IIb clinical trials to assure success with the larger and more geographically dispersed patient populations. Success is defined as all patients being dosed with drug product that is identical in strength and purity. The study exercise contributes to the product knowledge and is a critical component for commercialization. The methods to determine visible and sub-visible particle counts. A method to characterize any aggregates that may form post-testing. (Optional) A method to examine the molecule for signs of unfolding. Again, this testing would ideally be conducted by Phase IIb, and then repeated as a specific leg of the stability studies filed in the BLA submission. 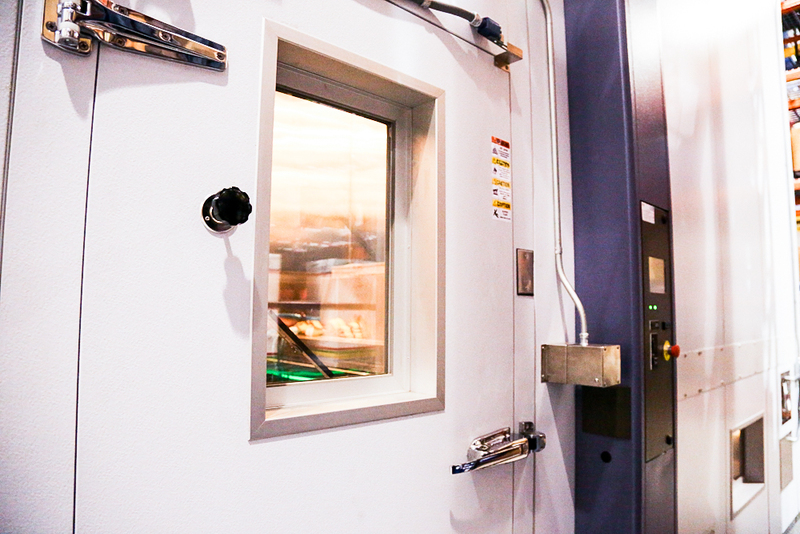 Inside this chamber, product can be exposed to specified levels of shock, vibration, pressure, and temperature as they occur during transport. There are two methods of exposure to the transport environment. One is make an actual shipment of product. Many companies interested in compiling product data have performed such tests. 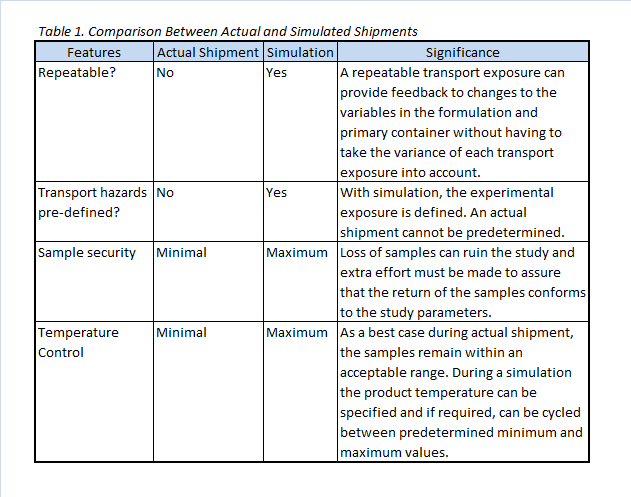 Another option is to conduct laboratory simulations of the transport environment. This option is new and offers some advantages to getting reliable information as shown in Table 1, below. Product Transport Validation utilizes parcel shippers because parcels are more susceptible to physical challenges of shock and vibration as compared to pallet loads of product. Inevitably, the product will be shipped in parcel shippers. The temperature ranges set by the client for these studies will normally be just outside of what would be considered the long-term storage condition. Therefore, the testing of the product is intended to force failure upon the parcel shipper and this test is not intended to confirm or refute the qualification of the shipper. The function of the shipper is to transfer the shock, vibration, and pressure of the environment to the primary container. No matter the method of exposure, the risk-based assessments from the various Ministries of Health are driving the need for product data beyond the classic stability studies.3,4 The expectation is focusing now to have evidence that the product retains its medicinal effectiveness over the life cycle of the product. Transportation is clearly a part of that life cycle. 1. Schellekens, H., Immunogenicity of therapeutic proteins: Clinical implications and future prospects. Clinical Therapeutics, 2002. 24(11): p. 1720-1740. 2.Fradkin, A.H., J.F. Carpenter, and T.W. Randolph, Immunogenicity of Aggregates of Recombinant Human Growth Hormone in Mouse Models. JOURNAL OF PHARMACEUTICAL SCIENCES, 2009. 98(9): p. 3247-3264. Formed in 2011, Modality Solutions immediately began the design and construction of a Transport Simulation Laboratory. 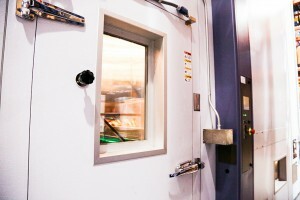 This laboratory employs a custom interface to expose a variety of pharmaceutical products to rigors of the transport environment in a controlled setting. The samples in the lab can literally experience transport around the world without leaving the controlled setting of the facility at BioConvergence. In addition, Modality offers a wide range of consulting capabilities. From leading the RFQ process for clients wanting to implement compliant passive packaging systems, to qualifying critical active and passive systems, Modality provides specific and targeted capabilities to complement their clients’ in-house staff. www.modality-solutions.com. After a 30-year career with Eli Lilly and Company, Paul became a founding member of Modality Solutions LLC and is now engaged in assisting companies that seek to establish and improve internal methods, practices to meet regulatory requirements related to distribution of high risk-high value drug substance, drug product and devices. Modality Solutions LLC is an alliance partner with BioConvergence and operates a transport simulation laboratory located on site.